La Antigua Guatemala ("the old Guatemala") is a wonderful destination for families interested in cultural exploration, shopping, adventure, and new experiences. Founded in the early 16th century, Antigua is a UNESCO World Heritage Site. Here you'll find cobblestone streets, shady plazas, captivating colonial architecture, authentic Mayan communities, active volcanoes, and so much more. Antigua is located about an hour's drive away from Guatemala City, but it's a world apart. This quaint town filled with colorful buildings is the perfect size for families and it's an excellent home base for exploring the region's attractions. Knowledgeable guides can bring Antigua's Spanish history to life and show you many of this city's highlights in a short period of time. Another favorite option, however, is to design your family's own personalized itinerary and explore this charming city at your leisure. See the Volcanoes: Three large volcanoes dominate the Antigua skyline. The oft-photographed Volc�n de Agua, or "Volcano of Water", stands to the south of the city directly behind St. Catherine's Arch. Ancatenango and Volc�n de Fuego ("Volcano of Fire") are located to the west. Smoke plumes from the top of active Fuego can be seen almost daily. For adventurous families with 'tweens and teens, climbing the nearby Pacaya Volcano is a popular tour. On your hike up this active volcano, there's a chance that you might see flowing red lava � and even roast a marshmallow or two. Explore the History: Antigua is filled to the brim with historic buildings. Some of the main sites include La Merced, a wedding cake-style Baroque yellow and white church; San Francisco Church and Monastery with its tomb of St. Hermano Pedro de San Jose de Betancur; the shady Parque Central with its lovely fountain; the ruins of Las Capuchinas convent; the iconic Calle del Arco; the beautifully restored Palace of the Captains-General; and the nearby Catedral de Santiago. Antigua's Museum of Colonial Art and Santo Domingo Museums are also of interest. Shop for Crafts & Textiles: Stroll down Antigua's cobblestone streets and you'll find boutiques selling colorful back-strap-loom woven textiles, embroidered blouses, cute wooden animals, handmade ceramics, intricately beaded necklaces, and a wide variety of other wares. Nim Po't, Casa de Artes, and Casa de los Gigantes offer a good selection of items. Antigua's handicraft markets are popular choices as well. Savor the Food: There are many excellent restaurants and caf�s within a ten-minute walk of Antigua's Parque Central. Choices include traditional Guatemalan food as well as French, Italian, Spanish, Mexican, and German cuisine. With its lovely courtyard and mouthwatering food, Las Antorchas is one of my favorites. Their steaks are excellent. Learn a Language: Antigua is one of the best places in the world to learn and perfect one's Spanish language skills. The city is home to over dozens of language schools and classes and daily, weekly or monthly programs are available. In addition to formal classes, Antigua's friendly residents and slower, unaccented way of speech makes it easy for kids and parents to practice their Spanish skills. Follow the Bean: Located near Antigua, Finca Filadelphia comprises approximately 250 acres of coffee plants. This family-owned coffee plantation continues its 140 years of coffee growing traditions as demonstrated on their informative two-hour tour. Coffee plants grow well in the region's volcanic soil and your family will be able to see the berries (called "oro verde" or "green gold") awaiting harvest and follow their progress from processing to the cup. Coffee lovers will even have an opportunity to taste the final product. For families seeking a bit more activity or a full day excursion, mule rides and canopy tours are also available here. If you can't visit Filadelphia Estate, make sure to sample some Antigua coffee at the Bagel Barn or one of the many caf�s in town. Connect with Mayan Culture: Guatemala is home to over 25 living ethnic groups, including Mayan, European and African cultures. As you wander through the streets of Antigua, you'll see many indigenous Mayans in their native dress. Approximately one-third of Guatemala's population is indigenous and many of the country's native Mayans adhere to their traditional ways, native Cakchiquel language, specialty foods, and colorful clothing styles. While in Antigua, take one of the many available day or overnight trips to visit extraordinary Mayan sites and nearby villages where your family can learn more about the Mayan culture and way of life. Discover Jade: The jade stone native to Guatemala is the rarer jadeite variety, found only in three places throughout the world. Jadeite comes in many colors including over twenty shades of green as well as lavender, white and black. Several jade shops and factories, including La Casa del Jade and Jades, S.A., offer tours where visitors can watch the stone being carved and polished into beautiful pieces � mostly by hand. One word of caution: much of the jade being sold on the street in Antigua is probably quartz. If you want the real thing, make your purchases at a reputable store that will certify that your stone is Guatemalan jadeite. Capture the Shots: Antigua's Volc�n de Agua is framed by the lovely yellow St. Catherine's Arch, providing a postcard perfect picture. Arrive early (well before 10 a.m. if possible) for the best chance of a cloudless, traffic free shot. Tours take visitors to the Cerro de la Cruz (Hill of the Cross) to capture iconic vistas of the city and Volc�n de Agua with the hill's cross in the foreground. The colonial city of Antigua is filled will incredible photo opportunities, so make sure to pack a big memory card for your camera. Take a Ride: There are many ways to see Antigua. View its sumptuous colonial architecture on a romantic horse-drawn carriage ride or try out one of the tiny tuk-tuks. Alternatively, hop on a colorful local "chicken bus" and visit neighboring towns and sites, practicing your Spanish along the way. If you're in the mood for a more adrenaline-charged ride, soar above the treetops on the canopy tour at the Filadelphia Estate. Experience a Holiday Festival: If you're lucky, your visit to Guatemala will coincide with one of its famed holidays. Semana Santa (Easter's Holy Week) is one of the most spectacular times to be in Antigua. The city's streets are lined with intricately designed carpets made up of flowers and colored sawdust and float-laden processional pageants take place daily. In early November, Day of the Dead celebrations are marked with the flying of elaborate colorful kites. Two of the best places to see these are Santiago Sacatep�quez and Sumpango � tiny towns located not far from Antigua. If you're looking for a family-friendly base of operations while in Antigua, the Soleil La Antigua Resort may fit the bill. This colonial style hotel is built around a large courtyard area with gardens and playground for children. Two heated swimming pools � one for adults and another for children � as well as tennis courts and a fitness center provide plenty of opportunities for recreation. The resort's guestrooms are spacious and well-equipped, many of them with fireplaces. A full spa and tour agency are also on the property. In addition, the resort's Kids' K-Boom program provides a special place for children to play and have fun. 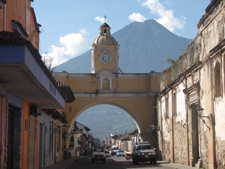 For more information on Antigua and other Guatemala tourism destinations, visit www.visitguatemala.com.